When was the last time you had a pasta dinner that excited you? Linguini with Pesto Genovese, for example. Perhaps that’s a dish that can wait until Friday when there will be more time to shop for fun ingredients. But you’re not a machine. Food is more than fuel. When we make a commitment to preparing simple and flavorful meals, we are giving ourselves more than the gift of improved health. We are making room to slow down and appreciate a sensory experience; to savor aromas, textures, and flavors. In an age where we spend most of our days anxious, time-crunched and under pressure, there exists an enormous temptation to deny ourselves a quiet moment in favor of efficiency. We’ll stop at a fast-food restaurant on the way home from work, instead of building a dinner out of whole food because we feel that we don’t have time for anything else. We don’t want to get home and realize that we can’t finish dinner because we couldn’t find shallots. The chefs at Tiberino designed their one-pot pasta dishes with this dilemma in mind. Their recipes are striking and original, and yet easy to prepare. requiring only the addition of water and the oil of your choice. 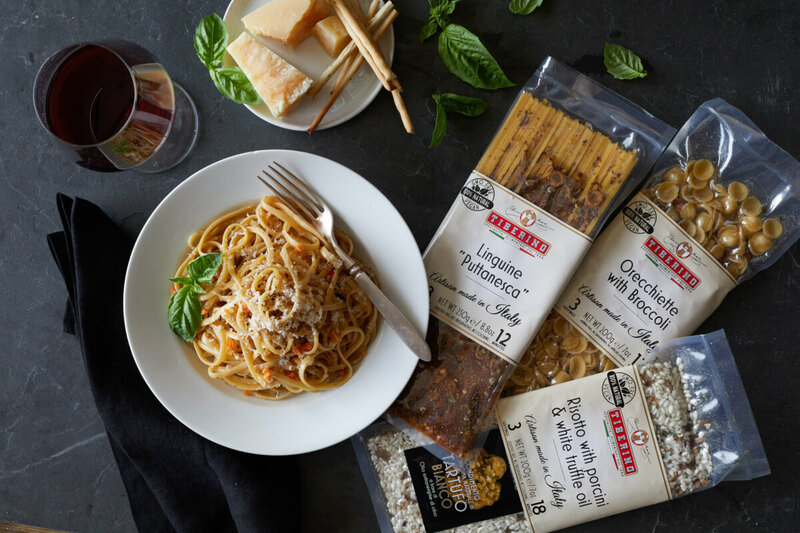 While Tiberino, a family-run business, has been creating traditional Italian meals for four generations, they have embraced the movement toward clean eating. Their product line is vegetarian and vegan-friendly, without animal derivatives or chemical ingredients. Their website contains pairing and enhancement suggestions for each dish. You are limited only by your imagination. Why wait for the weekend to prepare yourself Risotto with Porcini Mushrooms and White Truffle Olive Oil? You can create an unforgettable meal tonight, in the time it takes to set the dining room table. In case you’re wondering, yes…you meat eaters can (and should) saute some succulent shrimp or scallops to top off this pasta. It also pairs quite nicely with a petite fillet too.